Our philosopy here at La Guanaca, which reflects in our Lodge, is the love for antiques and objects with history and personality. We use recycled objects to which we reshape and bring to them new forms, uses and then we fit into our enviroments to create a cozy comfortable feeling, with a strong sense of ¨home¨ and ¨family¨ with the whole meaning that this words evoque. For this reason , our rooms are spartan with no extras or luxurys, no TV equipped and so, just the things you really need. 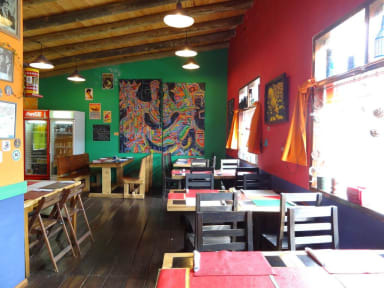 Also for this same reason you will be received and served by us , the proud owners of the lodge, since the very moment you arrive to the farewell time, a time that surely will have a strong ¨we will be back¨ flavour. La Guanaca is located in the village of El Chalten within the Los Glaciares National Park with peak famous for climbing. For this reason El Chalten was named Argentina's Trekking Capital or Capital Nacional del Trekking. There is no availability for La Guanaca on your selected dates. Great location in the city and owners were awesome. Room was as expected with a big double bed and clean bathroom ensuite. Really kind owners that were super friendly and happy to help with everything. Would definitely book again! 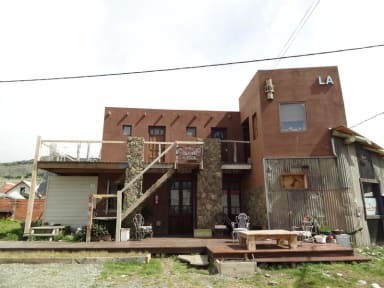 This hostel in el Chalten was perfect for us, we originally booked to stay for two nights but extended it by another 3 because we loved the area so much. Our hosts, Victoria and Marcelo were absolutely lovely and nothing was too much trouble for them. Breakfast was simple but adequate, the only downside was that the kitchen was very small and not very clean, so we ate out most nights. Our room was nice, cleaned everyday. Staff were so friendly and helpful, even though we have poor Spanish they tried to help us out. It doesn't have a common area so feels more like a hotel. Our bus was at 20.50 so we couldn't shower beforehand unfortunately. The breakfast was pastries and drinks. There is a tiny kitchen but you could cook if you really wanted to. We just used it to make lunches and boil eggs. V close to everything. Restaurant underneath is excellent and lovely staff. I never really saw La Guanaca. When we got there they said they were overbooked and they were sending us to a diff property which was better. Our standard is double room private bath. 1st night of 2 we got that. The 2nd night they put us in a room with 2 twin beds. Not the end of the world but not as promised. We then asked if we could go back to La Guanaca for another 2 days and they said yes. Ok. A few hrs we get a call that says no. All the time we felt like we were being jerked around.